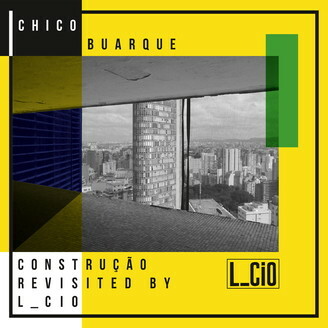 “Chico Buarque Construção Revisited” by L_cio is a beautiful debut project part of a DOC series of releases combining classic Brazilian names with DOC artists and producers. L_cio (Laercio Schwantes) the man with the transverse flute known for some of the freshest and unique tracks coming out from Brazil is behind this gemstone. Increasingly building a legacy of fans following his live performances and recent releases on DOC Records (Vazio; Traffic; People Talk; Schwantes), this man is a non-stoppable 30 hours machine gun. On this long awaited 2-track limited edition vinyl release, L_cio and Gui Boratto kept the roots of this classic track “Construção”. However they added all the proper elements of a techno dance floor knockout. By inserting malicious baselines, flutes and strings they generated aggressive melodies while keeping all characteristics of this epic song. Voted as the greatest Brazilian song by Rolling Stones magazine, “Construção was originaly recorded by Chico Buarque in 1971 with production by Roberto Menescal. Released during military dictatorship, Chico Buarque criticizes the way of life of the Brazilian workers, comparing them to machines. The song is known for its interchangeable last words, used “as if they were pieces of a board game”, as said by Buarque. Generatiions apart, Construção (L_cio & K_ri Version)” and “Construção (L_cio & Boratto’s Deconstructed Mix)” are the first ever authorized remixes in over 45 years. L_cio the latest dance floor brazilian soldier, a menacing builder of beats completes an epic turnnig point by editing and lapidating a classic poetry. With a B Side dub version beutifully crafted by label boss Gui Boratto, this limited edition pearl is finally here for our joy!